Last week, the first look at the annual data collected on staff at UK universities was published by the Higher Education Statistics Agency (HESA). As well as the usual information on the profile of staff, new statistics are available on staff who are on zero-hour contracts and those who are hourly-paid, as opposed to salaried. The introduction of collection of these data came from work undertaken between HESA and the New Joint Negotiating Committee for Higher Education Staff, formed of employer representatives including UCEA, and representatives from the Unions. Their work focuses on multi-employer negotiations and dialogue on pay and pay-related issues following on-going concerns about casualisation of the university workforce. Due to the nature of different types of employment within universities, the conclusions that these data lead you to is based on how you cut the data. 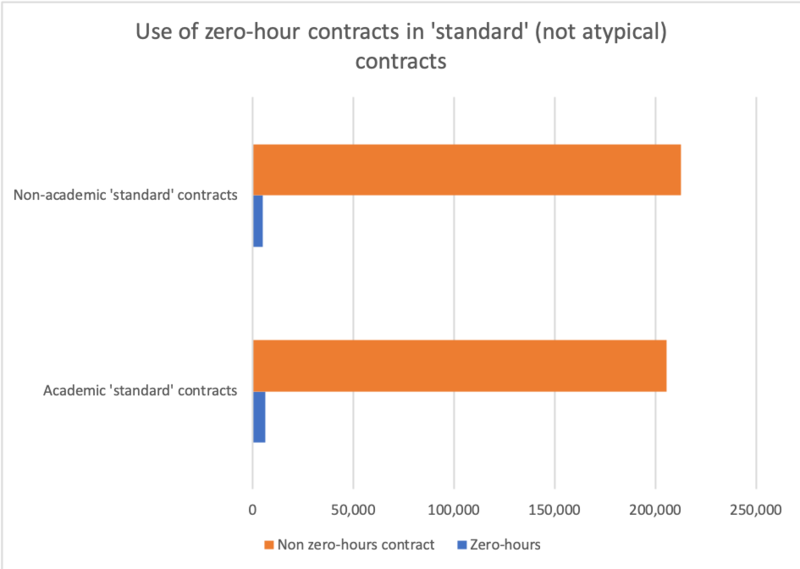 For staff on standard academic contracts, including both full and part-time workers, low numbers of zero-hours contracts were found to be in use, with only around 3% of the contracts for this group zero-hours. This is half the rate of the wider workforce; Office for National Statistics data give estimates of 6% of employees in the general population being on contracts that do not guarantee a minimum number of hours. HESA state atypical staff ‘form a separate population which is not comparable to those on other contract types’, meaning we cannot compare those on atypical and ‘standard’ contracts. Nonetheless, the numbers on atypical academic contracts are not insignificant; nearly 69,000 staff are employed on atypical academic contracts in across UK universities. Of these, almost a quarter (23%) are employed on a zero-hours contract. It is a matter of perspective over whether these are always damaging – employers often argue that these types of contracts may suit both employers and employees in circumstances. However these data demonstrate that where short-term or highly flexible contracts are used, employers are significantly also more likely to also use zero-hours contracts. The debate on this issue is therefore more informed by the new collection of these data, meaning we are able to speak on the nature of employment in higher education from an evidence base. Much of the focus on precarious employment within universities focuses on academic staff. Yet non-academic staff make up over half (51%) of the total workforce within universities. 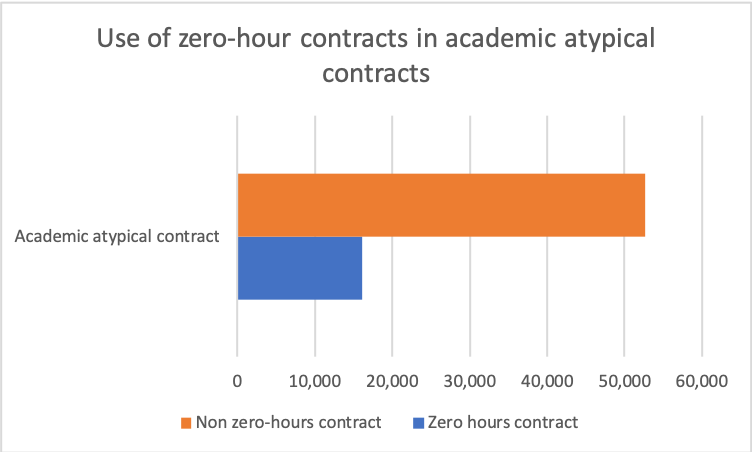 Levels of zero-hours staff on standard non-academic contracts are similarly low to academics, with only 2% having zero hours contracts. However, there is currently no available data on non-academic atypical contracts, and therefore we cannot be sure what role zero-hours contracts play among these staff. Between 2007/08 – 2014/15 HESA trialled the collection of data on non-academic atypical staff on an optional basis. It was unsuccessful, as it proved incredibly burdensome for universities to collect these data and the data collected were never to a publishable level. Since then, the Office for Students has said in its recent data strategy that it no longer requires universities to collect any data on non-academic staff. If collection of these data were to cease, we could be left with only a one-sided picture on what employment conditions within universities are like. The collection and publication of data on zero hours contracts in universities is a welcome addition. It is only with the fullest availability of data in these areas that we can have an informed debate on the role that these types of contracts play and shine a light on where there may be areas of bad practice. We should support the new collection of these data, which will allow us to monitor trends in the casualisation of university work over time, but we should also continue to push for the completest set of data across all types of staff, including non-academic staff, within our universities. ← A Friday thought: Should universities do more to help deliver non-selective schooling?